So if you need a warm, nostalgic look at the joys of winter, find this one! Or use it to supplement your Winter Olympics watching. It won't take you long to read, but you'll be glad you did. 5 stars: A little gem! 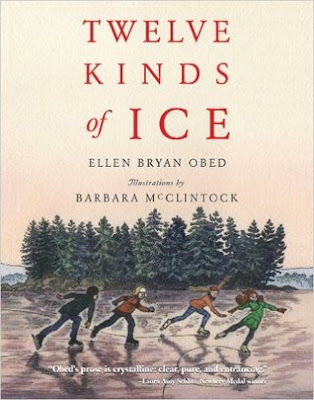 This slim book tells all about how the author's family used to make their vegetable garden into an ice skating rink every winter, complete with hockey, figure skating, and a big show at the end. Before Garden Ice comes, however, you have First Ice, Second Ice, Black Ice, Stream Ice, and others. I'm not much of a skater, but this one had me dreaming of flooding the garden this winter and strapping on some skates! The black and white illustrations perfectly matched the subject and were scattered liberally throughout the text. A book to savor together.